Gargling your throat with saline water can help combat cold as well as cough. Lemon juice can help in relieving the nasal congestion and preventing dehydration. Chopped garlic added to 2 tablespoons of honey every night also works well. Inhaling steam is 100 per cent effective in giving much wanted relief from head cold. A clear mucus drainage, study nose and shooting headache are some common symptoms you will experience when suffering from a head cold. 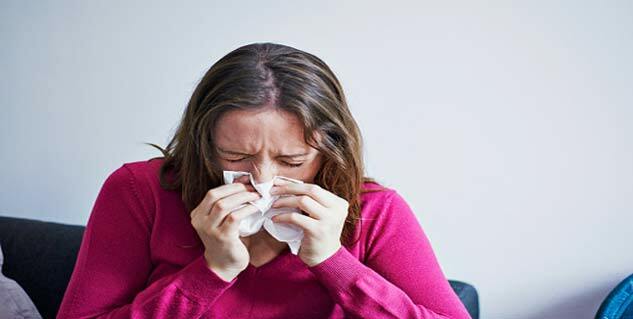 Head cold is commonly referred to as common cold and is caused by the body’s contact with viruses.Common cold mostly does not react or subside with the help of medicines and lasts a few days. The good news is that while medicines may not work their usual wonders, there are a host of remedies that you can seek refuge in right in your home. To treat the usual discomfort which you cannot really help, especially if you are stuck in a social situation, head to the washroom and release the pressure and heaviness that may be there in your head and blow the nose. Remember not to pull the mucus back to where it should not be. Blowing nose can help the mucus to clear. Gargling your throat with saline water can help combat cold as well as cough. One aromatic potion is sage tea gargling which can help one disinfect the oral cavity and inhale the beautiful essence. Lemon juice is a miracle drink for people with cold and cough. It can help in relieving the nasal congestion and preventing dehydration. Irritated membranes in the nose that surround the nasal passage may through the lemon get relief. For best results, try coupling a glass of water diluted with lemon juice and a spoon of honey dipped in it. Chopped garlic added to 2 tablespoons of honey every night can work well to ease cold and cough. You may also take cinnamon powder mixed with honey for three days to clear the sinuses. Hot ginger tea can help you in getting relief from head cold. You can easily make a nasal spray at home to clear your stuffed nasal passage with the help of saline water. Mix 1/4th of a teaspoon of salt along with baking soda in a glass of water. Take a dropper and fill it with this mixture. Take the spray and lean over a basin to spray it and squirt the water into your nasal passage. Close one nostril and spray the water in the other nostril. Let the water drain out and try the same procedure in the other nostril for a minimum of three times. Do not, however, overdo this as it will drain all the mucus in the nose away which is important to help you fight against infections. Inhaling steam is one of the best home remedies that are known to be 100 per cent effective in giving much wanted relief from head cold. Hold your head over a pot with boiling water and breathe the steam in. Doing so will help you clear the congestion and breathe in peace. The steam will also help in draining the phlegm and mucus that had been congesting the respiratory tract. Rub eucalyptus oil to clear a blocked nose. Eucalyptus oil is highly effective in clearing a blocked nose. Take a few drops of the oil onto your finger tips and rub it on the sides of the nose to clear the blockage. You may follow it up with a warm bath to relieve body ache or fatigue that may have been caused by the cold. Dryness in your surroundings can cause the viruses to lead to cold. Add a humidifier in your home to fight against the stuffy nose.